What Are the Best Online Master’s in History Programs of 2018? What Can I Learn in an Online Master’s in History Program? What Can I do with a Master’s in History Degree? How Much Can I Make with a Career in History? History is the foundation of all knowledge in any field. People who are drawn to a master’s in history degree may be history buffs but are also likely interested in professorships and other forms of education, museum work or research. This master’s allows graduates to pursue future doctoral work, and deepen their understanding of the people, places and events that have come before us. Find out what you’ll learn in an online master’s in history degree program, possible careers to pursue once you’ve earned your degree and the best online programs. A good master’s in history program prepares students for a variety of careers ranging from teaching to research and the social sciences. Below we’ve ranked the best online master’s in history programs using data from the Department of Education, the Integrated Postsecondary Education Data System (IPEDS) as well as information provided from the universities’ own published materials. All schools in this list are accredited. Named for a prominent American soldier and politician who played an important role in Texas' history, Sam Houston State University offers a Master of Arts in history program, which may be earned entirely or partially online. Students may opt not to complete a thesis and defend portfolios of written work instead (upon approval from a department chair). This 30- to 36-hour program may be completed in 1 of 3 educational tracks: rights and identity, war and violence or encounters and exchanges. To apply, a prospective student should submit the application and fee with transcripts of all college-level work, GRE scores, 2 letters of recommendation, an academic writing sample and a statement of intent, which will act as the cover letter. Online students may benefit from lower tuition costs than on-campus students, due to a lack of required fees. Once enrolled, these students also receive access to SHSU Online's Student Central, an online campus community that offers peer connection, information and advice about online learning. Other resources that may help online students at SHSU include career services, the writing center, the math center, online tutoring, degree planning and student mentoring. At Missouri State University, students interested in graduate-level history studies may complete their Master of Arts in history degrees online. The program enables students to concentrate in U.S. history, U.S. and world, or a specific global area (such as Europe). The program is designed to be flexible, with options to add a secondary education sub-track (for students looking to teach history at the high-school level), to do a thesis or not, to do a traditional or accelerated degree path and to complete the degree partially or fully online. M.A. students studying history also are highly encouraged to become proficient in a foreign language, and some advisers may require it. Interested prospective students must show evidence of bachelor's degrees with cumulative GPAs of at least 2.75. In lieu of this GPA, students with lower GPAs may have the option to submit GRE scores along with written recommendations from the Missouri State University history department head and the dean of the college. Online students do benefit from reduced tuition, with the average online tuition being more than $1,000 less than in-state, on-campus students, due to the lack of required student fees. Numerous student services are available to online students, include academic planning help, thesis resources, career counseling and tutoring. The online Master of Arts in history at Jackson State University can be completed with or without a thesis, in 1 of 3 concentrations: global, U.S. or African diaspora history. The 36-credit-hour program includes 30 hours of coursework, 6 hours of research and a thesis, or for the non-thesis option students complete 33 hours of coursework, 3 hours of research and a research project. A competency exam must be successfully completed in the first semester as well. To apply, an interested student must submit, along with the application, 2 official copies of transcripts from each college attended showing a GPA of 3.0 or higher, immunization records, 3 letters of recommendation, a statement of purpose and a writing sample. New online students take an online student orientation that familiarizes them with the online platform. A wealth of online library tools and online tutorials about various software applications are available to online students as well. At the University of Nebraska ? Kearney, students have the option to complete their Master of Arts in history online. This 36-credit-hour program offers flexibility: the choice to complete the degree with or without a master's thesis and fully or partially online. A public history track is also available. Students wishing to enter the program must have bachelor's degrees and at least 18 hours of college-level history coursework, as well as undergraduate GPAs of at least 3.25 (or, if lower, GRE scores). Additional admissions requirements include a letter of intent, a writing sample and 2 letters of recommendation. While enrolled, students must maintain GPAs of at least 3.0 in order to complete their degrees successfully. Students opting to complete the non-thesis program must compile academic portfolios and maintain GPAs of at least 3.5 in at least 12 credit hours. Online students may benefit from a number of resources designed to help students, including online video tutorials, online library tools, career services and test proctoring. Wayland Baptist University is a private, Christian institution that offers students interested in studying history at the graduate level a Master of Arts in history degree fully online. This 37-credit program features courses in U.S., British and world history as well as special topics such as World War I, World War II, the American West of the history of Latin America. Students may opt to complete a thesis or take 2 additional subject area courses. All students must pass a comprehensive exam to earn their degrees. With 4 terms in each year, classes are each 11 weeks long. Prospective students may earn college credit for work experience or professional training. Applications must be accompanied by official transcripts showing GPAs of at least 3.0, in which case admission is automatic. With a GPA of 2.7 to 2.99, transcripts must be accompanied by a writing sample; for 2.5-2.699, the writing sample and an interview are required and admission is probationary. WBU students have access to career services, counseling, tutoring and a number of other valuable student resources. Southwestern Assemblies of God University offers online learners the option of studying history at the graduate level. The master's degree in history can be earned either through a 30-credit-hour thesis or nonthesis option, or students may opt to complete an education track for 33 credit hours, with its emphasis on secondary education. The program doesn't provide teaching certifications; the necessary courses to do so must be taken in addition to the master's in history program. Both the thesis and non-thesis options include research components, but the non-thesis students complete research projects in lieu of their theses. All of SAGU's programs are delivered in the context of the Christian bible, and applicants must show evidence, through a minister's recommendation, of having a born again Christian experience in accordance with scriptures. Additional admission materials include official transcripts showing a cumulative GPA of at least 2.5, a recommendation from a college faculty member or administrator and GRE scores of 150 on verbal and 3.5 on analytical writing. Applicants also must have credit for 12 or more semester hours of upper-level undergraduate history under their belts. Once enrolled, SAGU students gain access to such resources as the career center, the on-campus wellness center and counseling. Students at Indiana State University who are interested in history may earn a fully online Master of Arts in history, which is primarily intended for future doctoral-degree candidates, or a fully online Master of Science in history, a more professional-oriented program designed to prepare students for work as historians, educators, archivists, curators or even writers. In either the M.A. or M.S., students may select a concentration in U.S., European or world history. Both 33-credit degrees can typically be completed in 3-5 years. The program is closed to students outside the U.S. and Canada except for certain military personnel and their families. Applicants must hold undergraduate degrees in history or related disciplines, with GPAs of at least 2.7 (and 3.0 in the last 60 hours of undergraduate work). GRE scores are also required for admission. Online learners receive support from the Student Services Concierge, which provides advice and guidance on academic matters, as well as from the career center, distance learning library tools, online time-management tools, distance education newsletters and a math and writing center. University of North Alabama offers a fully online Master of Arts in history with the option to earn the degree with or without a thesis. Students must select their preferred options by their second semesters, and those in the non-thesis program must successfully complete a comprehensive exam. This 33-credit-hour M.A. program is designed to be completed, with full-time study, in 2 years. Though it's a generalist program, courses emphasize U.S. history, and the degree can prepare students to teach secondary-school history, pursue doctoral-level study or enter professions in law, government, education, journalism or other fields complemented by a foundation in history. Applicants must show GPAs of at least 2.75 from their completed bachelor's programs, as well as satisfactory GRE scores, 3 recommendations, a short essay and a writing sample of at least 4 pages. Online students benefit from paying in-state tuition. Students gain access to resources including tutoring, study help and writing and math assistance. The online Master of Arts for history educators at the University of North Carolina Wilmington is specifically designed to train professional history teachers by providing them with the opportunity to conduct advanced history studies, an understanding of the latest research methods for historians and preparation in the most current teaching practices for the teaching of history. This program is designed to be taken year round, so that students can complete their degrees in 2 years. Students take 2 fully online courses during each of their 4 semesters, but they are required to take part in 2 on-campus summer institutes of 1 week each. The online courses are taught asynchronously, so there's no requirement to log on at any particular time in order to complete assignments. The program culminates in a capstone experience, during which students participate in hands-on applications of learning they've accumulated in teaching situations, as well as produce historiographic essays and successfully complete comprehensive exams covering program content. Professional educators in North Carolina are the preferred candidates for this program. To apply, prospective students must submit, with their applications, transcripts, GRE scores, 3 recommendations (2 from academics), a 500-word essay and a writing sample (a research paper is preferred). Online students at UNC Wilmington can access online training videos on a variety of topics, as well as the career center, academic support services such as a math lab and peer study sessions, tutoring and writing help. At Western Kentucky University, an aspiring history teacher or doctoral-level historian can begin those career paths by earning a Master of Arts in history. A traditional, on-campus, thesis-required degree program is available, but for those interested in completing this degree online, a non-thesis, online version is offered at WKU. This online program is structured so that classes take place throughout the year on a rotating basis, thus students may be able to complete their 36 hours of coursework and earn their degrees in 3 years. Students must take 3 hours of historiography, plus 12 hours (4 courses) in a concentration area and 21 hours of electives, as well as demonstrate competency in a research tool, which may include foreign language proficiency. A prospective student must possess a bachelor's degree and, with the application and fee, submit transcripts showing at least 18 undergraduate credit hours of history with a minimum GPA of 3.0, as well as a personal statement, a sample research paper and a GRE showing at least a 500 (pre-2011) or 153 (post-2011) verbal reasoning score. Online students have access to such resources as an online math lab, online writing lab, an online presentation coaching center and its Coaching for Academic Readiness Excellent & Success (CARES) resources. Through CARES, students sign up with coaches to develop personalized learning plans that address challenges such as time management and academics, and the coaches motivate and support students. The fully online Master of Arts in History program from the University of Memphis's U of M Global division is available in both thesis and non-thesis formats. U of M recommends that students who intend to pursue a doctoral degree and a career in advanced research or teaching at the university level choose the thesis option. Students intending the MA in History as their terminal degree most often choose the non-thesis option. Non-thesis students pursue careers as secondary or community college teachers, or in positions with private companies, nonprofit organizations or government agencies. Both degree options require 33 credit hours of coursework, which can be completed in 2 academic years. However, part-time study with a longer completion time is permitted. Admission into the program requires a bachelor's degree with at least 18 credit hours of history coursework earned with a minimum overall GPA of 3.0 or better. U of M determines admission based on an evaluation of several factors, including the nature of undergraduate coursework, standardized test (GRE or MAT) scores, a personal statement, a writing sample and recommendations. All U of M History graduate students are eligible for a wide range of support services, including comprehensive academic advisement, career counseling, graduate school workshops and access to additional professional development opportunities. Distance learners also have access to the extensive resources of the U of M University Libraries system. Pittsburgh State University's 100% online Master of Arts in History program provides individuals with solid research and investigative skills applicable to a broad range of professional and academic careers, including as history teachers. It also lays the foundation for continued doctorate-level academic pursuits. PSU's MA in History degree is available in 2 options. The Thesis option is strongly recommended for students intending to pursue a doctorate program, as it provides excellent preparation for researching and writing a dissertation. Thesis students must complete 30 credit hours of coursework to earn their degrees. The Seminar option requires passing 2 graduate seminars in history and completion of 1 of 3 track choices: a curricular project, including annotated bibliography and classroom materials; presentation of 2 revised and expanded seminar papers; or taking and passing a comprehensive exam covering a broad historical field. Admission into the degree program is determined by an evaluation of the applicant's academic background and experience. Applicants with a strong background in history may be admitted unconditionally, while students with an undergraduate GPA below 3.0 on history courses or less than 24 credit hours of undergraduate history coursework may be admitted conditionally and required to complete additional undergraduate coursework or meet certain other conditions set by the History Graduate Faculty. Students interested in pursuing careers as secondary social studies teachers or continuing their academic studies into doctoral programs may want to consider the Master of Arts in History offered by Louisiana Tech University. LTU's MA in History degree program is offered with both thesis and non-thesis options. The thesis option is recommended for students intending to continue their academic studies after obtaining their MA degree. Thesis students are required to complete a total of 30 credit hours of graduate work, 6 hours of which are devoted to thesis completion. The non-thesis option is intended primarily for students not anticipating doctoral-level studies. Non-thesis students are also required to complete 30 credit hours of coursework, submitting a minimum of 2 substantial research papers in lieu of a thesis. The program can be completed entirely online. 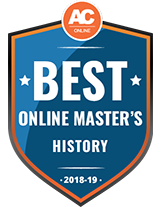 Admissions criteria for LTU's online MA in History program include a bachelor's degree with a major in history or the equivalent of a history minor (or 21 credit hours of history undergraduate coursework). Applicants must also submit a statement of purpose describing areas of interest and study objectives. Support resources for LTU distance learners include career advisement and job search assistance through the Career Center and access to databases, articles, journals, books and more via the Prescott Memorial Library's online portal. The University of Louisiana at Monroe's 30-credit-hour, non-thesis Master of Arts in History degree features coursework covering a broad base of U.S., European and world history topics, as well as the history of Louisiana and the South. Students receive valuable knowledge and skills applicable to careers in fields such as law, government, politics and education, and are prepared to continue on to doctorate-level studies. All coursework for this degree can be completed entirely online. Applicants to ULM's MA in History must possess a bachelor's degree earned with an overall GPA of 2.5 or better and including a minimum of 18 credit hours of humanities and/or social science coursework (at least half of which must be in the field of history). Other requirements include a minimum combined GRE score of 283 and minimum formula (GPA X GRE) score of 707.50. Applicants not meeting these requirements may still be admitted on conditional status. Support services for ULM distance students include IT assistance from the Office of Information Technology, career counseling through the Office of Career Connections and access to books, journals, databases and other research resources through ULM's University Library. The Master of Arts in History degree offered by Emporia State University is designed for students interested in the study of U.S. history from the colonial period to present day. Graduates with this degree often continue on with their studies to earn a doctorate degree or seek out careers as museum curators, community college instructors, historical site directors and in other related professional positions. Admissions requirements for ESU's MA in History online program include a bachelor's degree earned with an overall GPA of 3.0 or better and at least 12 hours of history coursework (also earned with a 3.0 GPA). Applicants must additionally submit a writing sample, statement of purpose and 2 letters of recommendation. The program is available in both thesis and non-thesis formats, as well as with the recently added Social Sciences Education concentration that emphasizes mastery of social sciences teaching methods within the professional educational context. The concentration, however, is not a licensure program. Students have the option of full-time or part-time study, and all courses are available in an online format, meaning the degree can be earned 100% online without any limitations on course choice. Distance learners have access to the extensive research resources of ESU's University Library & Archives system. Other student support services include career counseling, laboratories and tutoring (reading, writing, mathematics) services and IT assistance. Slippery Rock University's 30-credit-hour Master of Arts in History program offers advanced study of European, U.S. and world history delivered in a 100% online format. Graduates may go on to careers in government, the law, the military, private businesses and nonprofit organizations. Graduates are also qualified to continue their studies in a doctoral program. Admission into the program requires a bachelor's degree earned with a cumulative GPA of 3.0 or better. Applicants must also submit a 1-page essay on a student-selected current event that analyzes how the past influences the present as it relates to the event. Slippery Rock's MA in History program is designed to be completed with 24 months of full-time study. However, working students wishing to pursue their degree on a part-time basis may do so. Pass/fail comprehensive written exams are available in 3 geographic areas once students have completed 21 credit hours of coursework. Distance learners at Slippery Rock enjoy a number of support services, including academic advisement, career education and development (for both current students and alumni), and research assistance. Deep knowledge in such key areas as American History, World History or European history depending on the student’s specialization. What common courses are offered in a master’s in history program? Students learn the fundamentals of a wide range of archival activities, including appraisal, acquisitions, arrangement, description, reference and access. This course explores recordkeeping professions and the development of theories of the identification and management of records and recordkeeping systems. It will also look at the history and changing nature of records and recordkeeping systems, particularly those changes influenced by technology. A foundational class for any history program, historiography is the study of the history of histories. It reviews and evaluates histories written on various topics and it analyzes theories and methods that historians have used. In this advanced course, students study how history is written and write some history themselves. Students discuss how history writing has evolved over time, analyze their own writings of history, look at competing perspectives, apply historical research methodologies to original work and evaluate historians in their areas of interest. Most programs will include some variation on the topic of the American west or frontier. This course will likely explore the history of the trans-Mississippi West from the 16th century to the present. It will look at the numerous historical issues associated with the region, including cultural contact and conflict, economic development, visions and meanings of the West, human interaction with nature and the environment, relationship between western states and the federal government, tourism, the growth of the sunbelt cities and the shifting nature of race, class, gender and power in the region. A lesser-known outcome of a history degree is the pursuit of genealogy and family history. This course introduces students to the numerous materials available for researching the histories of individuals, families, and communities in the United States, Canada, the U.K., Australia and other parts of the world. Another common course in any master’s of history program will look at several world civilizations from antiquity to roughly 600 to 700 A.D. This course will explore religious, cultural, social, political and economic institutions of various societies. War and military history is, unfortunately, a persistent part of history. This course will explore the origins of such mass violence. It will use theory and case studies to suggest possible causes of international war, civil war, revolution and genocide. Each program has different requirements for graduation, but many will have a capstone project or thesis. Students looking to become professors, for example, may be expected to create a sample syllabus as part of the capstone project. In some history programs students also must demonstrate academic proficiency in a foreign language. Each program is unique. For some specializations, there may be additional certifications to acquire in addition to the degree. What specializations are available in a master’s in history program? Students with a specialization in American history will cover the history of the United States beginning with American colonial and early American history through the 20th century. A world history specialization focuses on a wide range of historical eras beginning with hunter-gatherers to more current, 20th century events across the globe. Students studying archiving will learn how to preserve and present historical knowledge and records, including through modern technologies like online archives. A public history track teaches students to use historical methodologies to preserve and present historical records and information to the public. Archivists appraise, edit and maintain permanent records, historical documents and historically valuable documents. They may also maintain databases of digital, film and hard copy. Job requirements might also include helping to arrange exhibits and create and maintain policy guidelines regarding public access to archived materials, exhibits, conduct tours, clean ancient objects and lead special research projects. Curators are the people who arrange, catalogue, present and maintain historical and cultural collections for museums, art galleries and academic institutions. Some curators also interact with the public and run exhibits and programs. A curator’s job will vary depending on the job location, the materials and whether or not there is public access to the archives. Genealogists studied the lineage of humans. Many specialize in a particular subset of genealogy, such as Native American genealogy or immigration. Genealogy professionals draw from a variety of records including cemetery, church, census, legal, military and property and tax records, as well as personal papers, books, research journals and the internet as sources of information. They complete pedigree charts, family group sheets and written reports of their findings. Historians gather historical data, write reports, help determine the authenticity of historical artifacts and preserve materials for places such as museums. Historians with advanced degrees focus on special topics in history and have career opportunities in higher education teaching and research. From elementary schools all the way up to universities, history professors are responsible for developing the curriculum and teaching history courses to people at an academic institution of some kind, from children to adults. They may lecture and teach in classrooms as well as research and publish related works. A professor may have multiple degrees, as well. Editors examine texts to verify facts, correct grammar and punctuation, and work with publishers to develop story ideas. There are several types of editors, such as copy editors, assistant editors and managing editors. Copy editors suggest revisions and oversee page layouts. An advanced degree in history prepares students for careers in academic editing. The American Historical Association is the largest professional organization serving historians in all fields and all professions. The AHA is a trusted voice advocating for history education, the professional work of historians and the critical role of historical thinking in public life. Founded in 1907, the Organization of American Historians (OAH) is the largest professional society dedicated to the teaching and study of American history. The mission of the organization is to promote excellence in the scholarship, teaching and presentation of American history, and to encourage wide discussion of historical questions and the equitable treatment of all practitioners of history. The National Council for History Education promotes historical literacy by creating opportunities for teachers and students to benefit from more history, better taught. Instructors from the elementary to collegiate level have access to professional development opportunities, diverse historical organizations, publications and information on developing issues in history education policy. Although salary will depend on a job holder’s location, experience and degree, the following list can give master’s in history students an idea of the types of careers and salaries available in the field of history. According to the Bureau of Labor Statistics, the employment of historians is projected to grow 6 percent from 2016 to 2026, which is considered as fast as the average for all occupations. However, in this field, there tend to be fewer jobs in relation to the number of applicants, so there may be a bit more competition than other occupations. Having a master’s degree would likely increase the odds of employment. A few careers, such as archivist and assistant history professor, however, are projected to grow between 13 and 15 percent between 2016 and 2026, which is much faster than average. The type of degree you have makes a difference in your ultimate salary. For example, according to the Center on Education and the Workforce, those with a bachelor’s degree in history, the median annual salary is $53,000, while those with a master’s in history earn $80,000, a significant difference. Master’s in history programs are accredited by local and regional bodies that set standards for the curriculum as well as measure educational outcomes for the graduates. The two main kinds of accrediting organizations are regional and national. Regionally accredited universities belong to one of six such accreditation agencies across the U.S., such as the New England Association of Schools and Colleges. Nationally accredited universities, those which offer vocational or distance learning programs, are reviewed by the accrediting agency approximately every three to five years and include The Higher Learning Commission. Financing a master’s in History may require a combination of financing options. In some programs there may be research or assistantship opportunities, as well as grant opportunities. One should always check out the Free Application for Federal Student Aid (FAFSA) to see what funding is available. Below are some funding options for master’s of history students. The DAR Centennial Scholarship is awarded to two outstanding students pursuing a course of graduate study in the field of historic preservation at a college or university in the United States. This scholarship was established from a portion of the proceeds from the sale of the Centennial Pin. This is a one-time award in the amount of $2,500. Sponsored by the Abraham Lincoln Brigade Archives (ALBA), the George Watt Memorial Essay Contest is for graduate and undergraduate U.S. students who submit a 3,500 to 7,500-word essay about any aspect of the Spanish Civil War, the global political or cultural struggles against fascism in the 1920s and 1930s, or the contributions of the Americans who fought in support of the Spanish Republic. Work will be judged on the basis of originality, effectiveness of argument, and quality of research. The Intercollegiate Studies Institute offers the Western Civilization Fellowship Program to grant $20,000 to full-time U.S. graduate students who pursue work related to the Western Civilization Studies. Eligible candidates are required to submit an original ten-page essay, one-page outline of prior education, three-page autobiography, three letters of recommendation and official transcripts of all undergraduate and graduate work. The institute provides annual short-term research fellowships in the amount of $3000 to scholars working in the field of American history.